From the creators of the celebrated FINAL FANTASY TACTICS comes one of the most highly anticipated sequels to the "Tactics" franchise. 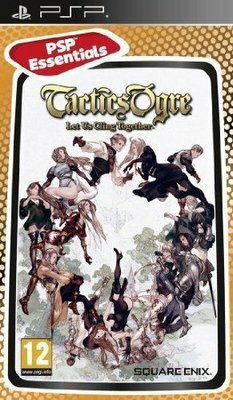 Hiroshi Minagawa (Director), Akihiko Yoshida (Character Design), Yasumi Matsuno (Game Design), Hitoshi Sakimoto and Masaharu Iwata (Composers), all key members of the original TACTICS OGRE development team, have reunited to deliver the ultimate version of this definitive tactical RPG experience. The Valerian Isles, jewels of the Obero Sea. Long a center of naval commerce, the people here have struggled throughout history for dominion over these shores. Finally there rose a man to put an end to this conflict. His name: Dorgalua Oberyth. But history would know him as the Dynast-King. Dorgalua took the disparate races of men calling the islands home and united them as one. For fully half a century he reigned, and Valeria knew prosperity. But upon his death, three clans rose to claim Valeria for themselves: the aristocratic Bakram, the teeming Galgastani, and the few but hardy Walister. Valeria was once again in the grip of a great blood war. The Bakram and the Galgastani quickly divided Valeria between themselves, and an uneasy quiet has since settled over the isles. Yet none believe the calm will last. As Denam makes decisions, the story takes on new shape—a true multi-story system! Not only Denam's story, but the stories of those around him evolve based on your choices. Watch as former enemies become allies, new characters join the story, and familiar scenes take unexpected twists. It's a different tale with each telling. When Denam moves across the world map, a battle may take place at his destination or along the way. The battle party screen appears when Denam is drawn into a battle. Here, you can select the units you wish to deploy, as well as examine unit stats and change equipment. The maximum number of units will vary depending on the battle. The terms of victory are displayed as the battle commences. Meet these conditions to win the battle. In "Vanquish" missions, defeat the specified unit to win, or all enemies if your instructions are to "Vanquish All Foes." Friends and foes alike take turns based on their RT (Recovery Time), a value determined by each unit's speed and equipment. A unit's turn is known as its AT, or Attack Turn. When the terms of victory are met, the battle is won. If the terms called for defeating a specific unit, the battle ends when that unit falls, regardless of what other units remain standing. After winning a battle, the results screen lists items collected from bags of loot left unclaimed on the battlefield. Note that any unclaimed tarot cards will be lost. You can also see how many experience and skill points your units earned. "Tactics" Evolved: Yasumi Matsuno, creator of the original TACTICS OGRE and FINAL FANTASY TACTICS, has taken the chapter structure and story of the game and built upon it to create a new experience in Tactics Ogre: Let Us Cling Together. Destiny is at Your Fingertips: The game includes an entirely new system based on the tenth tarot card, the Wheel of Fortune. The Wheel of Fortune represents the clash of free will and destiny, cyclicality and perpetuity—concepts central to the game's core design. This system enables players to consider their choices and the results, both in terms of story progression and battle. Many Tales in One: Watch as former enemies become allies, new characters join the story, and familiar scenes take unexpected twists. It's a different tale with each telling. 3D Graphics + Pixel Art = 3DP: Tactics Ogre: Let Us Cling Together preserves the original's sprite-graphics style while revamping the battlefield in 3D! Step back and take in the entire battlefield, change your perspective for a birds-eye view, or simply change the viewing angle to see around obstacles such as buildings. Dozens of Characters: Meet Dame Ravness and other entirely new characters unseen in the original Tactics Ogre. Familiar characters, too, have received a redesign from Akihiko Yoshida and Tsubasa Masao, adding a new level of detail to the nearly sixty characters populating the story of TACTICS OGRE. Unit Development: Rather than developing individual units, the focus is placed on raising the player's army as a whole. Unlike most strategy RPGs, which assign levels to individual units, units of the same class gain levels collectively in Tactics Ogre. You're not just raising characters, you're raising an army–all while enjoying the unique strategies each class affords. Challenge Battles: Create a challenge party from the units in any of your saved games and use the PSP's wireless feature to exchange parties with your friends and pit their forces against yours! The more powerful your forces become in the game, the more deadly the challenge party you can create.